� In Chicago 2009 Youngs became the first American woman to surpass $1 million in career domestic earnings. � In 2009 Youngs won a domestic title for the 11th consecutive year, setting the all-time mark previously held by Janice Harrer (10 in a row). � She is one of eight players to win a Manhattan Beach Open title with three different partners, and has appeared in the title match of that event in eight of the last nine years. � Youngs was ranked in the top five in season points on the AVP Tour from 2001-2007. � In individual format events on the AVP Tour, Youngs finished second in 2000 and 2001 and was a chosen partner in 2004-06 before winning in 2007. 2009: Youngs and Branagh appeared in the championship match in each of their first 12 AVP events, winning nine times. Youngs won her third Manhattan Beach Open title as the duo swept all seven opponents. The win in Muskegon gave Youngs her 50th career title, tying for sixth all-time. Internationally the duo placed fifth in the World Championships before claiming the bronze medal in the Gstaad Grand Slam and a silver in Klagenfurt. 2008: Youngs and Branagh advanced to the semifinals in 11 of 12 events and to six finals. The duo won two events and finished as the third-ranked team on the Tour. For the second straight year, they won the Cuervo Gold Crown Championship. Youngs ranked second in aces per game (.94) and third in hitting percentage (.471). On the FIVB Tour, they won four medals in eight events en route to qualifying for the Beijing Olympics In claiming the title in Barcelona, became just the second team to rebound from a second-round loss to win an event. Youngs and Branagh were fifth in the world in qualifying, and placed fifth in Beijing. 2007: Played the entire season with Branagh, and they won the season opener in Miami. Youngs and Branagh were in the semifinals in 12 of 14 events, winning three of the 10 finals they competed in. Their second win, in Seaside Heights, set the mark for the longest match in AVP history (1:41). Finished as the second-ranked team on the Tour and won the Cuervo Gold Crown Series as the only team to play in all three of the finals in the first three events, earning a $100,000 team bonus. Youngs won the Goddess of the Beach title after defeating Kerri Walsh in the finals. Youngs ranked fourth in aces per game (.96) and eighth in hitting percentage (.440). On the FIVB Tour, they played in eight events, earning two bronze and a silver medal in their last three tournaments. 2006: Won twice with podium finishes in 10 AVP events with Wacholder before the pair split up. In Seaside Heights, Youngs became the third American woman to surpass $1 million in career earnings. Youngs partnered with Nicole Branagh for the final three AVP and FIVB events of the year, with one third-place finish as the highest placement. Youngs ended as the Tour's leader in aces per game (1.07), and ranked fourth in hitting percentage (.482) and sixth in blocks (.88). 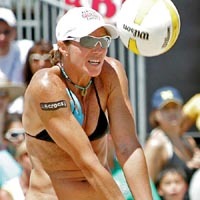 2005: Began her partnership with Rachel Wacholder with a pair of second place finishes, completing the AVP season with three victories and podium finishes in all 13 tournaments. They were the only team to defeat Kerri Walsh and Misty May-Treanor during the domestic season. Finished second in aces per game (.99), third in hitting percentage (.484) and fourth in blocks (1.01). Internationally the duo won three medals in seven events. 2004: Youngs and McPeak won four AVP titles, including the Manhattan Beach Open, garnering podium finishes in all 10 team events. Internationally they won two titles and collected six medals in eight tournaments. They finished the Olympic qualifying process ranked fourth in the world, and won a bronze medal in the Athens Games, marking the first ever Olympic medal for U.S. women. Statistically on the AVP, Youngs led the tour in aces per game (.81), was second in blocks (1.15) and was third in both kills (7.08) and hitting percentage (.476). 2003: Won once on the AVP title to go with seven second-place finishes. Youngs completed her third straight season advancing undefeated to the semifinals in every tournament. Internationally, Youngs and McPeak had a second-place finish in seven events. 2002: Began the year playing with Holly McPeak, and the duo won the first three tournaments of their partnership. For the second straight season, Youngs finished as the top-ranked player on the AVP Tour after collecting five wins in seven events. On the FIVB Tour, Youngs and McPeak won four titles and garnered seven podium finishes in their eight tournaments. Youngs was ranked in the top 10 on the FIVB Tour for the fourth consecutive year. 2001: Had podium finishes in all six domestic events, including her first Manhattan Beach Open title, en route to a season points championship on the AVP Tour while partnering with Barbra Fontana. 2000: Won a domestic title on a fourth different tour, then collected her first three FIVB titles. With Masakayan, just missed qualifying for the 2000 Olympics as their 2,556 points were 50 shy of the second U.S. spot. 1999: Won four domestic titles on two tours, and with Liz Masakayan formed the fourth-ranked team on the FIVB Tour with three medals in seven events. 1998: Competed almost exclusively on the FIVB Tour, with a best of third and a season-ending ranking of 14th. 1997: In her first ever pro beach event Youngs showed her capability as she placed third. She won two events on the year, and played in four FIVB events with a best of fourth. Hot Winter Nights: Played in the test event in 2007 in Albany, finishing second, then in the final event of 2008 in Las Vegas, finishing second again. In 2009 she played five times, finishing second three times. Indoor Volleyball: Before her transition to the beach, Youngs spent three years on the National Indoor Team and competed at the Atlanta Olympics in 1996. She went on to live in Rome and played in an Italian professional indoor league and then moved to Ankara, Turkey to play indoor professionally for an additional year. College: Youngs attended UCLA and graduated in 1993 with a degree in history. While in college, she was a four-time All-American and her team won the 1991 National Championship. Personal: "EY" was born in El Toro, California and grew up alongside four brothers.